Gandhiji, during his visit to Madurai stayed in the residence of Sri Ramji Kalyanji, 175-A, West Masi Street, Madurai who respectfully invited him to his house, on 21.09.1921. During his stay there at night he was mentally agitated and worried to think of the various farmers and poor people on his way dressed in scarce cloths that is only a small towel like dhothi around the waist and were shivering with cold, while he was wearing long turbans khurtha and dhoties. So overnight he took a decision that he should be a model to everyone and to dress in a simple manner like the peasants and poor people he witnessed in his journey to Madurai and he carried out this from the very next day itself. 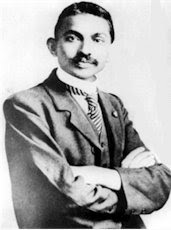 On 22-09-1921 (the next day) morning all were shocked to see him in his new pattern of dress and Gandhiji explained them about his decision and he followed this throughout his life. 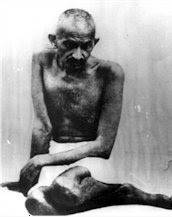 Then he attended the meetings in Madurai (The place now called as Gandhi Pottal) at 0700 hrs, explaining the reason for his new mode of dress.It was just because of this reason Gandhi Museum was established in madurai overlooking several other big cities after he was assasinated. The Gandhi Memorial Museum is meant to be a living Institutions and not merely a building preserving and showing exhibits, however precious. It seeks to help an ever increasing number of people particularly the youth of the country to understand and to value the life, work and teachings of Gandhiji. Gandhi Memorial Museum also conducts an Educational Programme for the students of the Colleges and High Schools of Madurai City. They undergo a methodical one day study course of 7 hours duration, on the history of "Indian Freedom Movement" and on a brief study of "Gandhiji's life".